DESCRIPTION: The eye is all black, and the snout has some speckled white on it. These milk snakes are from the arid high deserts of eastern Morelos, southern Puebla, and northern Oaxaca, Mexico. They are nocturnal and hunt small rodents, birds, amphibians, and even other small snakes. During the day, they sleep curled up in small spaces. Pueblan milk snakes have a place in the hearts of pet owners. Docile, non-venomous, and easy to take care of, they are a perfect snake for the beginner, and are one of the most common bought as pets. 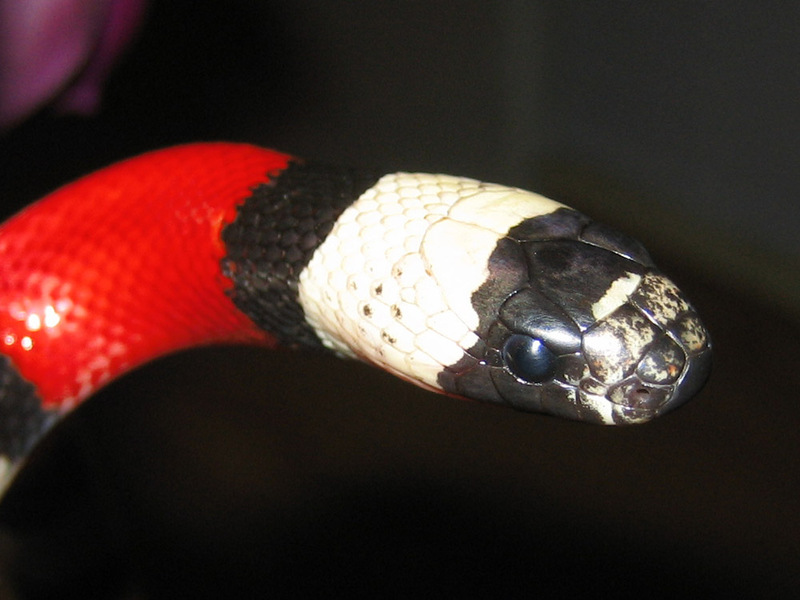 They are colorful, with bands of red, black, and white, and are small enough to live in a standard vivarium. One reason Pueblan milk snakes are so popular as pets is because they are so easy to tame. Handling them is safe and easy. They like being active and like being taken out of their enclosure for exercise. If they become alarmed, they will excrete an unpleasant musky smell, but will calm down over time. Feeding them in captivity consists of a diet of mice and rats. When choosing a rodent size, it is important to pay attention to the size of the snake. The rodent should be small enough to fit the size of their mouth, but large enough to create a visible bump in their body once ingested. The vivarium should be set up with heating equipment to keep the cool blooded milk snake warm, ideally 85 degrees or so. A heating mat or a light bulb with a dimmer switch and bulb guard can be used and the heat should only cover about one-third of the surface area. A cool space on the other side of the vivarium should be created for temperature regulation. Milk snakes like small hiding places. Owners should create two of them; one in the warmth and one in the cool area. They should be able to find a safe, relaxing space on each side for easier control of their body temperature.